Objective: To examine the effects of protective headgear in adolescent football (soccer) players. Setting: Oakville Soccer Club, Oakville, Canada. Participants: Football players aged 12–17 years. Intervention: A questionnaire examining the 2006 football season using self-reported symptoms. Main outcome measures: The number of concussions experienced during the current football season, the duration of symptoms, injuries to the head and face and any associated risk factors for these injuries. Results: In the population studied, 47.8% had experienced symptoms of a concussion during the current football year. 26.9% of athletes who wore headgear (HG) and 52.8% of those who did not wear headgear (No-HG) had concussions. Approximately 4 out of 5 athletes in each group did not realize they had suffered a concussion. More than one concussion was experienced by 50.0% of the concussed HG athletes and 69.3% of the concussed No-HG group. 23.9% of all concussed players experienced symptoms for at least 1 day or longer. Variables that increased the risk of suffering a concussion during the 2006 football year included being female and not wearing headgear. Being female and not wearing football headgear increased the risk of suffering an abrasion, laceration or contusion on areas of the head covered by football headgear. Conclusion: Adolescent football players experience a significant number of concussions. Being female may increase the risk of suffering a concussion and injuries on the head and face, while the use of football headgear may decrease the risk of sustaining these injuries. In the past few years, some football players have utilized soft football headgear in an effort to reduce the number of head injuries and concussions. The international governing organization of football (Fédération Internationale de Football Association or FIFA) now permits the use of soft football headgear in games.22 In the United States, a national standard has been recently adopted for football headgear in an effort to ensure quality and safety levels for the different football headgear products.31 While several leagues and football facilities in North America have already mandated the use of protective headgear for football,32 33 its use is not yet widespread. Prospective studies on concussion in football have shown that head-to-head contact between players is the most common mechanism of injury resulting in concussion.2 34 Laboratory research on the potential benefits of headgear has shown that models studied could potentially reduce the risk of concussion during head-to-head impact.35 Despite the possible benefits, no studies examining the actual effects on athletes of wearing football headgear have been published. The authors and the university ethics review board decided that in the absence of any previous clinical research on headgear, a prospective study could not commence for fear the headgear could actually have a harmful effect. As such, this study was done to determine a general effect of headgear on adolescent football players before any prospective study that would introduce such equipment in a population of minors. The findings are to be used in planning a future prospective study examining the effects of headgear in youth football. The study was undertaken from August to October 2006 in conjunction with the Oakville Soccer Club (OSC), Oakville, Canada. Travel teams from specific age groups (aged 12–17 years) were targeted for inclusion in the study because several of the adolescent teams in the OSC wear football headgear. There were estimated to be 440 athletes (220 boys and 220 girls) competing on travel teams between the ages of 12 and 17 years. It was believed that the limiting factor in any study assessing the benefits (or risks) of football headgear would be finding enough players who wear headgear. The study was designed to recruit as many athletes as possible from these teams during the last few months of the 2006 OSC outdoor football season. Data was collected primarily through an online survey via a link that was placed on the home page of the OSC from August until October 2006. While the athlete could return to the online survey to update his or her symptoms at a later point in the season, the collection of data is considered retrospective. The online survey allowed only one survey per web address in an effort to ensure no one person could submit more than one completed survey. The survey used was anonymous and almost identical to surveys previously used to assess concussions in professional and university athletes.5 25 36 While this makes it impossible to confirm or gather further data from a player, it was decided that players would be less inhibited in answering an anonymous questionnaire and anonymity would be better for confidentiality given the age of the respondents. The survey inquired about general background information, past football history, past recognized concussions and episodes of loss of consciousness (LOC). The players were questioned specifically about the 2006 spring and summer football season, including different positions, number of games played, if they considered themselves someone who heads the ball frequently (a “header”), how often on average they head the ball per game and the use of mouthguards. When asked about the use of headgear, players were asked if they wear headgear when playing football, which type of headgear they wear and how often they wear this headgear during games and practices. They were also asked about any contusions, lacerations or abrasions around the head and face area that they had sustained during the year, noting whether they were wearing or not wearing headgear. The players were then questioned more specifically about any symptoms that occurred immediately after being hit in the head in 2006 only, using a format identical to previous questionnaires,5 25 36 again noting whether they were wearing or not wearing headgear at the time of injury. The definition of concussion as put forth by the Concussion in Sport Group (CISG) was used as the basis for diagnosing concussions.37 They defined a concussion as any alteration in cerebral function caused by a direct or indirect (rotational) force transmitted to the head resulting in one or more of the following acute signs or symptoms: a brief LOC, light-headedness, vertigo, cognitive/memory dysfunction, tinnitus, blurred vision, difficulty concentrating, amnesia, headache, nausea, vomiting, photophobia or balance disturbances. Similarly for this study, a concussion was considered to have occurred if a subject reported a LOC, confusion or disorientation, or any of the other commonly recognized concussion symptoms listed above, immediately after being hit in the head playing football.38 39 The number of concussions was conservatively estimated to be the maximum number of times that any one symptom was experienced and not the cumulative number of all symptoms experienced. A recognized concussion was predefined to have occurred when a respondent answered affirmative to having experienced one of the common concussion symptoms after being hit in the head and also answered that they had experienced a concussion during this episode. An unrecognized concussion was predefined to have occurred when a respondent answered affirmative to having experienced one of the common concussion symptoms after being hit in the head but answered that they had not experienced a concussion during this episode. All statistical analyses were carried out using SAS software version 9.1 (SAS Institute Inc., Cary, NC, USA). Descriptive analyses were created for all study variables using means, standard deviations and percentages where appropriate. Two-by-two tables correlating concussions with various potential predictors were created to investigate these relationships. Where statistical inferences are made, the outcome of interest is binary: whether the subject did or did not have at least one concussion during the 2006 season. For this type of outcome, the analysis of choice is logistic regression, which models the log-odds of getting a concussion in terms of other risk factors or predictors and not counts or rates. Owing to the fact that the outcome of interest (concussion) is not rare, odds ratios (OR) may overestimate relative risk (RR), and thus methods to get adjusted RR are preferred in this type of cross-sectional study.40 We have applied a modified version of Poisson regression,41 as implemented in Proc GENMOD in SAS.42 Although Poisson regression is often used as a model for count data, the modified version allows it to be applied to binary data and results can be interpreted as RR. All statistical tests are two-tailed. A p value <0.05 is considered evidence of statistical significance. The university ethics review board approved the study. There were 347 completed surveys collected. In large part because the travel teams with athletes aged 17 years also included athletes aged 18 years, 69 of the completed questionnaires that did not meet the age inclusion criteria had to be excluded from the analysis. As such, 278 surveys were completed from athletes aged between 12 and 17 years and were used for analysis. Of these, 216 were included in the non-headgear-wearing group (No-HG) and 52 were included in the headgear-wearing group (HG). Ten players could not be accurately classified as wearing or not wearing headgear. The average player profiles are listed in table 1. The HG and No-HG groups were very similar in most respects, except the majority of the HG group were female, had more past recognized concussions and were more likely to wear a mouthguard. Of the 52 athletes who answered that they wore headgear, 50 answered that they wore headgear described as “a headgear with no chin strap and protection around the front, sides and back of the head, but with an opening on the top of the head” (see fig 1), while only two answered that they wore “a thin strap-type headgear with no chin strap and most of the protection on the front of the head”. All of the HG athletes responded that they wore the headgear all or the majority of the time for games (52/52), while less responded that they wore it all or the majority of the time for practices (36/52). The breakdown of primary positions played for each group is listed in table 2. Figure 1 Twelve-year-old girl wearing soccer headgear described as “a headgear with no chin strap and protection around the front, sides and back of the head, but with an opening on the top of the head”. Parental/guardian informed consent was obtained for publication of this figure. While 7.2% (20/278) of all players recognized they had experienced at least one concussion during the 2006 season, 47.8% (133/278) responded that they had symptoms of at least one concussion. In other words, of the 133 athletes who actually experienced a concussion, only 15.0% (20/133) of these realized the symptoms they had experienced represented a concussion. Of all No-HG athletes, 52.8% (114/216) reported symptoms of at least one concussion, and out of those only 14.9% (17/114) realized the symptoms they experienced represented a concussion. For the HG group, 26.9% (14/52) of these athletes reported signs of a concussion, but only 21.4% (3/14) recognized that they had suffered a concussion. For those athletes who did experience at least one concussion, the conservative estimates for the number of concussions (the maximum number of any one symptom only, not all symptoms combined) are listed in table 3. The independent variables that were examined and their effect on the risk of concussion are listed in table 4. The percentage of players from each position who experienced at least one concussion during the 2006 season are listed in table 5. The duration of the concussion symptoms are listed in table 6. It refers to the length of time that the longest concussion symptom lasted for each concussed athlete. The data revealed 23.9% (28/117) of concussed athletes experienced symptoms for 1 day or longer. Table 7 lists the individual symptoms and frequency they were experienced by the athletes. Table 8 lists the occurrence of abrasions, lacerations and contusions on the head and face for the 2006 season. Injuries on the face were the most common for each group, followed by injuries to the forehead/front of the head. When calculating RR for variables that may have predisposed to injuries, girls were more at risk to have injuries to these areas (RR = 1.93, p<0.001). As most football headgear covers the front, side, back and possibly the top of the head, with no coverage for the face, RRs were calculated for different variables that may have predisposed to injury to the front, back, side and top of the head only (ie, not including the face). For this group, athletes who did not wear headgear were more likely to suffer an injury to these areas (RR = 1.86, p<0.05), as were female athletes (RR = 1.72, p<0.02). The study showed that in this adolescent population, female athletes and athletes who did not wear headgear were more likely to suffer a concussion during the 2006 football season. While research has shown that female players are more likely to suffer a concussion in football,25 45 this is the first clinical study to examine the effects of protective headgear in football. One study has shown that in the biomechanical laboratory, these headgear have the potential to decrease concussions during a head-to-head impact on average 32.6%.35 In keeping with these findings, wearing football headgear in this study population did decrease the risk of suffering a concussion during the 2006 football season. In addition, the headgear also decreased the risk of suffering an abrasion, laceration or contusion around the front, side, back and top of the head. These are the areas commonly covered by most football headgear, although some provide more protection than others around the top, side and back of the head. The headgear did not provide any protective effect for abrasions, lacerations or contusions on the face. In fact the percentage of athletes suffering these injuries around the face was similar for the HG and No-HG groups. There have been some suggestions that the use of such protective equipment may change the style of play of athletes, perhaps making them more aggressive and prone to injury. Although only examining one area, at least for certain injuries around the face, wearing headgear did not seem to make the athletes more prone to these injuries. Although not reaching statistical significance, playing more games and a past traumatic LOC showed a trend towards increasing the risk of suffering a concussion during the 2006 season. Similarly, considering oneself a header did show a trend towards increasing the risk of suffering a concussion. This may have more to do with the style of play and perhaps aggressiveness, given that the player’s perception of the average number of headings per game, while known to not always be accurate, did not show any effect on the risk of suffering a concussion. The HG athletes also had more past recognized concussions and this may have influenced their choice to wear headgear. While it can be argued that this group’s past history of recognized concussions would have made them more at risk for concussion and thus any protective effect of headgear may be even more substantial in this group, this study is unable to determine this possible effect. As this is a preliminary study, all results and effects will need to be confirmed in a larger prospective study on similar athletes. As in previous research, headache and confusion/disorientation were the two most common symptoms in all concussed athletes, followed by dizziness/balance problems.5 25 36 46 Of those athletes who suffered a concussion, over two thirds of the No-HG group and half of the HG athletes suffered more than one concussion. The study also showed that the majority of concussions suffered by this population would be considered “simple” (symptoms resolve without complication over 7–10 days) by the new concussion classification suggested by the CISG.44 Only 6.0% (7/117) of concussed players had their longest symptom last for 1 week or longer. As in previous studies, this study used what, in the past, may have been considered a liberal definition of inclusion in that a concussion was considered to have occurred if an athlete reported a LOC, confusion or disorientation, or any of the other most commonly accepted symptoms of a concussion (headaches, dizziness/balance problems, memory difficulties, blurred or abnormal vision, nausea, hearing problems or light sensitivity) immediately after being hit in the head playing football. Although the players were asked about only those common concussion symptoms that occurred immediately after being hit in the head, it is possible that the inclusion criteria overestimated the number and severity of concussions. It is difficult to interpret an athlete’s recollection of a LOC, as they may overestimate this occurrence. At the very least, this usually implies amnesia for the event and would nevertheless indicate a concussion. Also, the symptom of headache may be difficult to attribute solely to concussions, especially since recent research has shown that around 20% of athletes who play American football in high school and college may experience headaches during games.47 As such, table 7 allows the reader to see the list and occurrence of the individual symptoms suffered by the concussed athletes. In addition, our results suffer the limitations of cross-sectional data, namely, the inability to control for all variables and assess a temporal association between risks factors and "outcome". We do believe, however, that useful data can be gathered from a cross-sectional study, especially as an initial step in collecting information about an as yet unstudied piece of protective equipment. Adolescent football players experience a significant number of concussions and recognize their symptoms as a concussion at a degree similar to previously studied populations. While being female increased the risk of experiencing a concussion, the use of football headgear decreased this risk during the 2006 football season. Similarly, being female increased the risk of suffering an abrasion, laceration or contusion around the head and face, while wearing headgear decreased the risk of these injures over the areas covered by headgear. Head injury and concussion rates in football are similar to those for American football and ice hockey for both elite and recreational athletes. Head-to-head collisions are believed to be the most common mechanism causing concussions in football—laboratory testing has shown football headgear may protect against concussion in head-to-head collisions. Most sport-related concussions are unrecognized or unreported by athletes. In the adolescent population studied, athletes who were female and those who had suffered a previous concussion were more likely to wear football headgear. Football headgear provided protection against concussions in the population studied. Football headgear provided protection against soft tissue injuries (contusions, lacerations, abrasions) over areas covered by the headgear. Athletes who wore football headgear were at no increased risk of injury over areas of the head and face not covered by the headgear. Similar to university and professional athletes, the vast majority of concussions in adolescent football players go unrecognized. The authors would like to thank John Freihaut and the players, parents and coaches of the Oakville Soccer Club. Without their interest and involvement, the study would not have been accomplished.
. Concussion history in elite male and female soccer players. Am J Sports Med 1998;26:433–8.
. Epidemiological considerations of concussions among intercollegiate athletes. 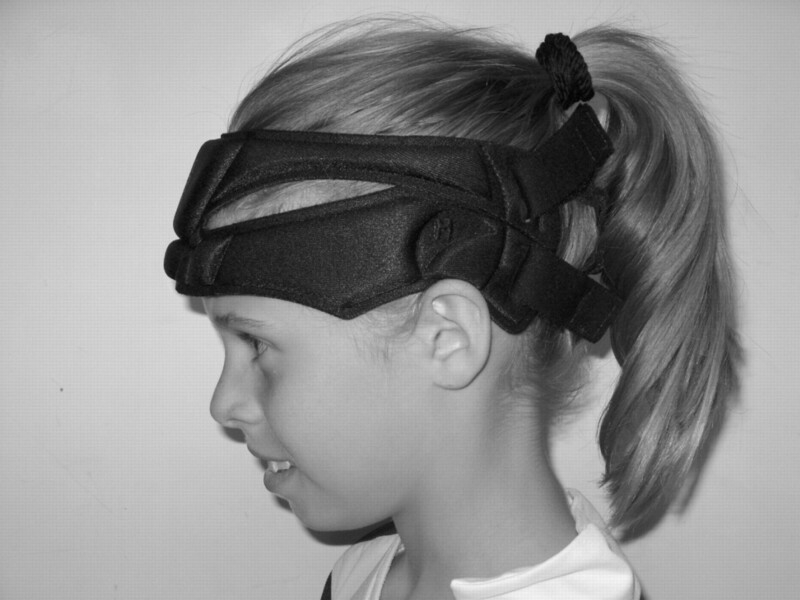 Appl Neuropsychol 2003;10:12–22.
. Has the time come for protective headgear for soccer? Clin J Sport Med 1999;9:121–3.
. Concussions among university football and soccer players: a pilot study. Clin J Sport Med 2001;11:234–40.
. Heading and head injuries in soccer. Sports Med 2001;31:369–86.
. Brain damage in former association football players. An evaluation by cerebral computed tomography. Neuroradiology 1989;31:44–8.
. Association football injuries to the brain. A preliminary report. Br J Sports Med 1981;15:163–6.
. Soccer injuries to the brain. A neurologic and electroencephalographic study of active football players. Am J Sports Med 1989;17:573–8.
. Soccer injuries to the brain. A neuropsychologic study of former soccer players. Am J Sports Med 1991;19:56–60.
. Head and neck injuries in soccer. Impact of minor trauma. Sports Med 1992;14:200–13. Pediatrics TAAo. A policy statement. The Physician and Sportsmedicine 1988;16:165–9.
. Presentation and mechanisms of concussion in professional Rugby League Football. J Sci Med Sport 2004;7:400–4.
. Head injuries presenting to emergency departments in the United States from 1990 to 1999 for ice hockey, soccer, and football. Clin J Sport Med 2004;14:80–7.
. Head injuries and concussions in soccer. Clin J Sport Med 2005;15:216–9.
. Are brain injuries a significant problem in soccer? Clin Sports Med 1998;17:795–809, viii.
. Medical aspects of heading the ball. The Physician and Sportsmedicine 1984;12:127–31. Pediatrics AAo. Injuries in youth soccer: a subject review. American Academy of Pediatrics. Committee on Sports Medicine and Fitness. Pediatrics 2000;105(3 Pt 1):659–61.
. Medical aspects of heading the ball in soccer. The Physician and Sportsmedicine 1984;12:127–31.
. Goal post injuries in soccer. A laboratory and field testing analysis of a preventive intervention. Am J Sports Med 1995;23:340–4.
. Management of sports-related concussions. Dent Clin North Am 2000;44:67–83.
. The relation of mouth protectors to cranial pressure and deformation. J Am Dent Assoc 1967;74:735–40.
. Mouthguards: protection against shock to head, neck and teeth. Basal Facts 1987;9:133–9. http://webstore.ansi.org/RecordDetail.aspx?sku = ASTM+F2439–06 (accessed Nov 2007). DATABASE.CART/REDLINE_PAGES/F2439.htm.31.006 (accessed ??).
. No evidence of impaired neurocognitive performance in collegiate soccer players. Am J Sports Med 2002;30:157–62. http://www.astm.org/SNEWS/AUGUST_2000/aug_soccer.html. 2000 (accessed Nov 2007).
. Mechanisms of injury for concussions in university football, ice hockey, and soccer: a pilot study. Clin J Sport Med 2006;16:162–5.
. Effectiveness of headgear in football. Br J Sports Med 2005;39(Suppl 1):i40–8; discussion i48.
. Summary and agreement statement of the 1st international symposium on concussion in sport, Vienna 2001. Clin J Sport Med 2002;12:6–11.
. Epidemiology of concussion in collegiate and high school football players. Am J Sports Med 2000;28:643–50.
. Recognition and characteristics of concussions in the emergency department population. J Emerg Med 2005;29:189–97.
. Summary and Agreement Statement of the 2nd International Conference on Concussion in Sport, Prague 2004. Clin J Sport Med 2005;15:48–55.
. Concussion incidences and severity in secondary school varsity football players. Am J Public Health 1983;73:1370–5.
. Prevalence of headaches in football players. Med Sci Sports Exerc 2000;32:1820–4.
. The ‘ding’: amnestic states in football trauma. Neurology 1973;23:196–7. Patient consent: Parental/guardian informed consent was obtained for publication of fig 1. British Journal of Sports Medicine 2008; 42 115-115 Published Online First: 06 Feb 2008.